Monterey, CA (May 10, 2017) – In recognition of its victorious, high-stakes stand to protect some of the oldest water rights in California, Byron-Bethany Irrigation District (BBID) was honored Wednesday with the 2017 ACWA (Association of California Water Agencies) Excellence in Water Leadership Award. 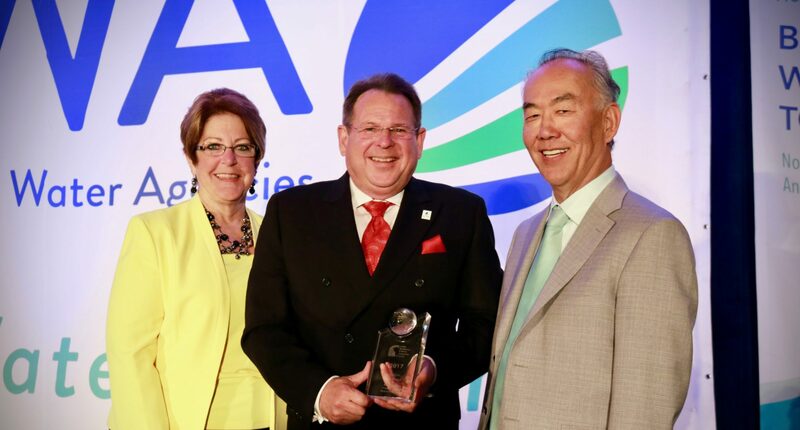 According to ACWA, the prestigious annual award recognizes those who make a “remarkable and visible contribution to the enhancement, protection or development of water resources in California.” The award was presented at ACWA’s Spring Conference in Monterey to BBID GM Rick Gilmore, and BBID Board President Russell Kagehiro, who accepted on behalf of BBID’s Board of Directors. ACWA President Kathleen Tiegs, left, poses with BBID GM Rick Gilmore, center, and BBID Board President Russell Kagehiro. Amidst harsh drought in 2015, the State Water Resources Control Board (SWRCB) issued unprecedented curtailments, and subsequently accused BBID of taking water when none was available, threatening a $5-plus million fine. BBID’s legal team fought back to preserve the District’s pre-1914 water rights, disproving the state’s arguments. The SWRCB eventually dismissed the case, securing a victory that would resonate throughout California’s water community. BBID was nominated for the Excellence in Water Leadership Award by the San Luis & Delta-Mendota Water Authority (SLDMWA), a collective of water agencies representing more than 2 million acres of 29 federal and exchange water service contractors. The 2017 Excellence in Water Leadership Award. Demonstrating BBID’s deep connection to its community, numerous Letters of support were submitted on BBID’s behalf, including one from Gay Costa of the Mountain House School District. Another letter was submitted by former BBID counsel and current in-house counsel for Placer County Water Agency, Dan Kelly. As part of the Excellence in Water Leadership Award, BBID will be privileged to present a $5,000 charitable donation to a non-profit organization of their choosing that works toward the enhancement and protection of California’s water resources. 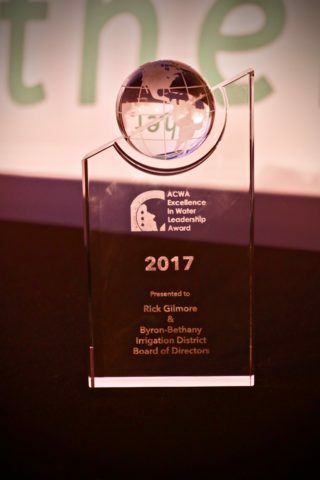 WATCH: Click below to see BBID accept the 2017 ACWA Excellence in Water Leadership Award! Byron, CA (April 17, 2019) – Today, the U.S. Bureau of Reclamation (Reclamation) announced a slight increase in the allocation for South-of-Delta Central Valley Project (CVP) contractors, to 65%. This comes at a time the state’s snowpack is so dense it’s been referred to as a “water supply dream,” and every reservoir used to supply South-of-Delta operations is above 100% of normal. 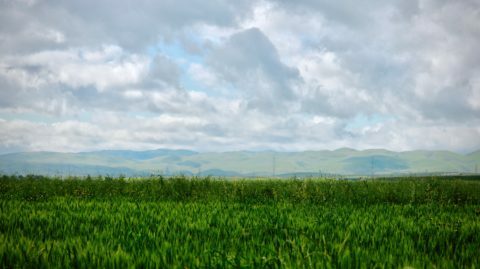 At the outset of the 2019 growing season, the uncertainty created by continually delayed allocation announcements makes it extremely difficult for farmers to plan their operations. Today, the Byron-Bethany Irrigation District (BBID) called for state lawmakers to take action to amend SB1, proposed legislation the District believes is “over-broad, duplicative and unworkable.” Read the full letter below. On Wednesday, Byron-Bethany Irrigation District (BBID) expressed its support for an amended version of SB 454, part of the District’s ongoing efforts to ensure fairness for California’s water rights holders. Read the full letter below. WATCH: Taking advantage of recent rains, Byron-Bethany Irrigation District (BBID) crews took action to “smoke out” leaks in the Byron Sanitary District sewer collection system. Watch the full video below! Byron, CA (March 22, 2019) – On Friday, the Byron-Bethany Irrigation District (BBID) and West Side Irrigation District (WSID) jointly issued a public review draft of a Municipal Service Review (MSR) and Sphere of Influence (SOI) related to a planned consolidation with between BBID and WSID. The report addresses major issues of service delivery and efficiency and includes an analysis and a written statement of conclusions, for multiple factors, including growth and population projections for the affected area, disadvantaged unincorporated communities, present and planned capacity of public facilities, financial ability of the agency to provide services, opportunities for shared facilities, and more. The two Districts have been working collaboratively with interested stakeholders in both service areas for quite some time. The planned consolidation would help secure greater water reliability and improve delivery efficiencies. The public review draft will be sent to the San Joaquin County Local Agency Formation Commission (LAFCO) for review. The full report is below. The Byron-Bethany Irrigation District issued the following letter, urging support for backfill funding for Paradise Irrigation District (PID). 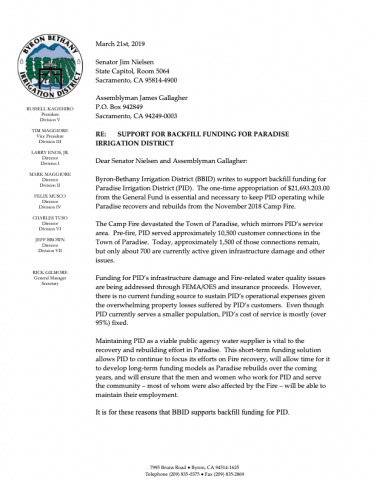 The one-time appropriation is necessary to keep PID operating while Paradise recovers and rebuilds from the November 2018 Camp Fire. “Reclamation’s initial allocation tells an all-too-familiar story. Despite above-average water supplies, CVP water deliveries are being restricted by outdated science and failed regulations, forcing growers to make do with less water. This month, California has seen 18 trillion gallons of precipitation – enough to fill Lake Shasta 12 times. Our snowpack is well above normal. Runoff into many of the state’s main reservoirs this year is projected to be as much as 1.1 million-acre-feet higherthan at this time in 2012. Mother Nature is doing her part. Today, the Byron-Bethany Irrigation District (BBID) joined other local water agencies, calling on newly-elected U.S. Representative Josh Harder (D-Turlock) to pursue a seat on the House Committee on Natural Resources. Byron, CA (December 18, 2018) – At its regular board meeting Tuesday, the Byron-Bethany Irrigation District (BBID) announced the District has issued $5 million in revenue bonds. The bonds will be used to fund significant capital improvement projects, securing the ongoing reliability of BBID’s water deliveries for years to come. The District’s financial consultants delivered a presentation to the Board, describing the financial details laid out in the report below. FRESNO, CA – Today the United States Bureau of Reclamation and the California Department of Water Resources announced a series of agreements to resolve water conflicts that have vexed the State for decades and to reaffirm the collaborative partnership between the Federal and State governments to develop long-term solutions to California’s major water problems. The Byron-Bethany Irrigation District (BBID) joined other water agencies in supporting the historic agreement.